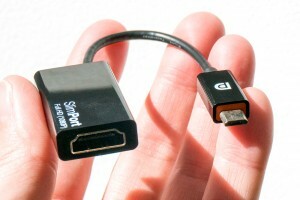 On a phone, SlimPort uses the phone's existing, standard micro-USB or USB Type-C connector. It does not require a dedicated connector. The mobile device must specifically support SlimPort; not all phones with micro-USB or USB Type-C connectors support SlimPort. A small SlimPort adaptor is required. SlimPort adaptors are designed to work with any display that supports industry-standard connectors; unlike phones, displays do not need to be specifically designed to work with SlimPort. SlimPort adaptors are available for most popular types of display connectors, including standard HDMI, DisplayPort, DVI, and VGA. SlimPort supports full 1080p HD video and surround sound.